By the time John Sugrue emerged, all smiles, through the door of the Laois dressing-room, the ball had only just been thrown in for the Dublin v Longford game. Technically then, we didn't know who Laois would be playing in their first Leinster final since 2007 on June 24, which spared Sugrue from having to speak about the province's insatiable beast - the Dublin team skittling records now on a weekly basis. "We have another game in Leinster," he nodded, solemnly. "We wanted to stay in Leinster for as long as we could and we will see who comes through the other semi-final and we will go hard at it. "We are going to try and play our football as best we can." It sounded like a genuine promise. Laois, who spent the spring floating between the footballing backwaters of Division 4 of the League, are back now in a Leinster final after more than a decade's absence. Perhaps of greater significance, given the climate of the province just now, they are just one game away from a spot in the newly-appointed Super 8s even if they lose. They did it by beating Carlow for a third time this year yesterday - no mean feat given the arduousness of that task just now. 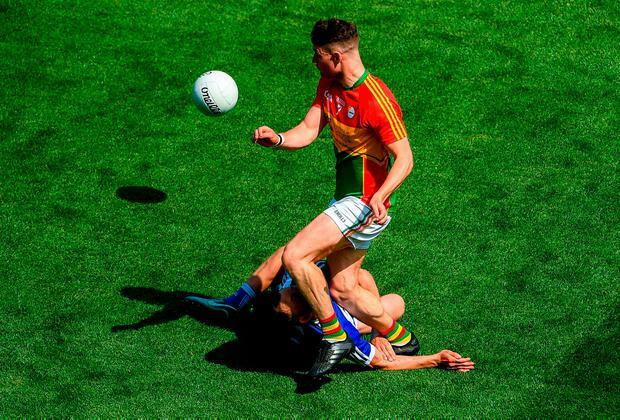 Carlow came to Croke Park and set up in the same structured, populated, adhesive way that has seen them spring to life under Turlough O'Brien's charismatic management - which effectively meant the game was played on their terms. "You've got to set up on your own terms," Sugrue stressed. "You can't just want to charge straight through them and do as you please." That required huge patience in attack and given the accuracy of Paul Broderick's free-taking, great discipline in defence. Routinely, Laois's ball-carriers became enmeshed in the Carlow net of defenders strewn along their '45'. They led by 0-6 to 0-3 at half-time, but were lucky to survive a breach of their defence by Diarmuid Walsh. In fact, Carlow had the three best goal chances of the match but took none and then, inexplicably, Broderick missed a free from 30 metres and was blocked down by Gareth Dillon from close range moments after. "Carlow, to be fair to them, were very stiff opposition," Sugrue said. "They took a long, long time to break down and it took a long, long time to get a few scores ahead to ensure that we were comfortable. "They stuck with us in the second-half and at times it probably went a bit too close for comfort for us." Late on, Donie Kingston and Evan O'Carroll pinched points as Carlow pushed on in search of a game-saving goal, leaving space in behind their midfield for the first time. O'Carroll came on and made a significant contribution, despite the death of his father Micheál during the week. "That fella has been standing up inside the dressing-room this year and doing a big job for us," Sugrue commented. "A great sign of steel inside in a fella and it's probably a fitting tribute to his dad that he came out and he finished the game for us today."